used the pack called 'wet media brushes' on photoshop cs2. one layer and two hours. reading the Dr. Zhivago i just remember the snow... the snow made me remember wolfs and wolfs... solitude; crawling, howling... calling a soul friend and finally: no reply. as always, you are all alone. they are wolves dressed of lambs. Pero como te dije, al principio cuesta darse cuenta que es. Congratulations and thnaks for sharing it! 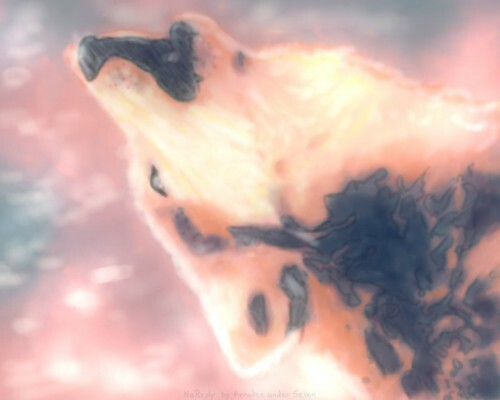 This is just amazing, the wolf seems to be burning, the effects you got are just superb. why you took it out from the minimalist project? man...you need to stop submitting stuff from places if you are gonna earase them three seconds after, no? back to the wall, I do thing it's a very interesting way of painting, it doesnt look conventional, and well yeah we need more innovators around so that's pretty good, the colors are also quite catchy to see, hope you dont decide earase it soon. I don't really get it, but it's really pretty. ^^ Looking at it makes me feel... interesting. It took me a minute to figure out what this was...I really it know that I figured out it was a wolf. I'm a dork. Great colors for the purokon. I really do not like, because profit not to appreciate in totality the image, the colors I feel and I see that they are seen well, but the image that you used to not convinces me. So ThAnK Wow Nice ! WHAT ?